The new software, camera upgrade, gremlin removal -whatever it was has made the images so much better - excellent in fact. Well done and thanks. Now if the BOM could get the Cape de Coudiac buoy working that would make life so much gooderer. Cheers, Cgrover, Ben was down there last week with the upgrade. The quality is amazing isn't it! Agree that the cam is so much clearer, but is it going to pan over to the point at some stage? We have a second point cam going on shortly. I knew there was reason I joined up!!!! A second angle pointed along towards day Street would be ex. Any eta? Couple of weeks. We have all of the hardware, just making a custom bracket for the camera mount. Nice imagery today. How's the forehand carve in the first image. That you, LT? Any progress on the camera panning at Middleton Point? Waiting for a new custom camera bracket to be manufactured, it’s taking a little longer than expected. Camera and cabling is onsite ready to go so will go in immediately once the bracket is done. Guys I run an engineering/fabrication workshop and could have made you a 100 brackets by now. Let me know if you need any help. Currently making similar for Adel oval complex. I've got a local fabricator up here, but am having difficulties creating CAD drawings. Where are you based? In Netley at the end of Richmond road waving to the pilots on the runway. Sorry, snowed under with a million things. Will get to it as soon as we can. what's happening with the cam at Middleton? Will it ever show more than the point? Sorry mate, I haven’t forgotten about this, just had a million other things a little higher on the list. Since September 17 2017 the camera has remained pointed at a very limited area of Middleton Point and is the only one now the south coast. Unless it points up the beach or gives a much wider view it is of little use. I know SA is pretty limited in terms of the number of punters but I wonder if it was a Qld or NSW camera would the job be a bit more urgent.??? It's not that. We replaced a PTZ ("Pan Tilt Zoom") camera with two fixed cameras. This is a broader surfcam stratey being implemented at some locations to tie in with our new replay system. However, when we put in the two cameras, the second fixed one - aimed at the Point - couldn't see the Point properly because of the angle of the balcony it was to be mounted on. So, we needed to get a custom bracket built. You can't buy these things off the shelf, they have to be designed from the ground up, and then manufactured. Cue a couple of weeks to-ing and fro-ing with a local (NSW) fabricator to get one done, who ended up deciding he couldn't because I didn't supply a CAD design, then a few more weeks trying to work out how to create a CAD design, all the while with a backlog of a million other things, then Xmas, New Year, staff holidays, hospital visits and the like. And suddenly, it's February. Seriously, no-one wants this to go live more than me - the camera is sitting there waiting to be plugged in! But, I'd got so much work on at the moment that it's really hard to allocate time to finish it off. 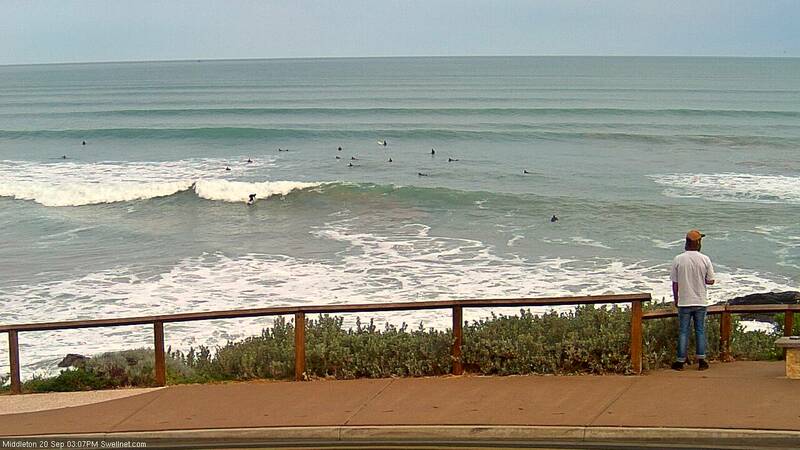 BTW, we currently have five SA surfcams (Triggs will be live next week) and Middleton Point will make six. That's more than we have in Vic, more than we have in WA and around half as many as we have in Qld (pretty impressive when you consider the numbers of surfers in Qld compared to the number of surfers in Adelaide). And, it's five more than our competitor too. So again, I'm sorry for the delay - but there's only so many hours in the day. I'll try to get it done ASAP. There ain't no conspiracy otherwise (we've had other surfcams in other states offline for much longer). BTW, the Middleton cam isn't "the only one now the south coast". We have a Knights cam too, which has been in place for around 12 years. Thanks for the prompt reply. The Knights cam and the now defunct ? Chiton cam don't usually give much of a clue as to the conditions down south unless it is really big and a southerly swell - usually winter -or you're a bodyboarder - which you know . 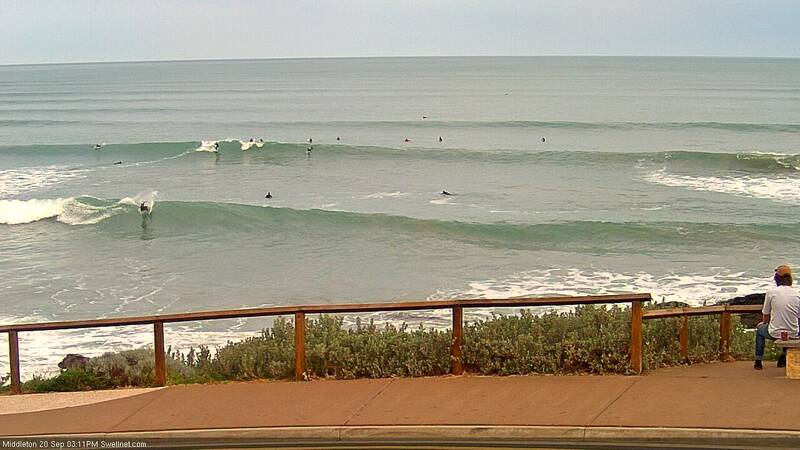 My point was being able to see down the beach towards Goolwa lets you know if its ok to surf the dark side size-wise or the Waits-Parsons trip is the only option. I'm sorry you're flat out and I do really like the site and the service usually provided. Thanks mate, I'll try to get it underway ASAP. 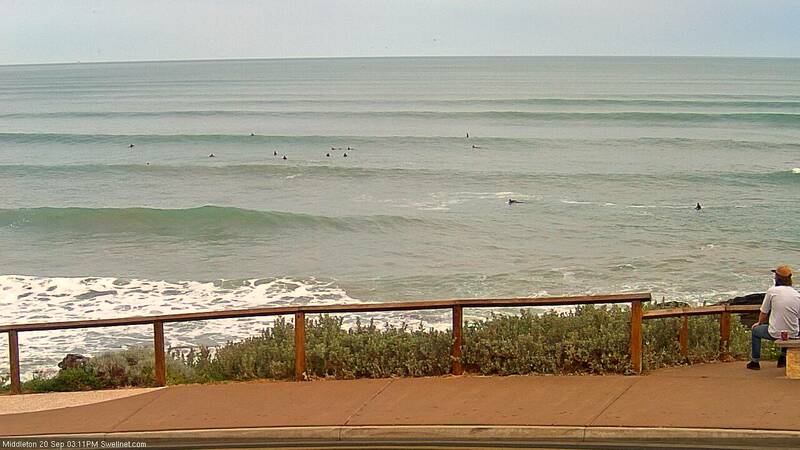 FWIW, we have another five SA surfcams lined up ready to go, once the timing is suitable. Sweet again I really like the site use it multiple times daily and appreciate the fact you have taken the time to reply. 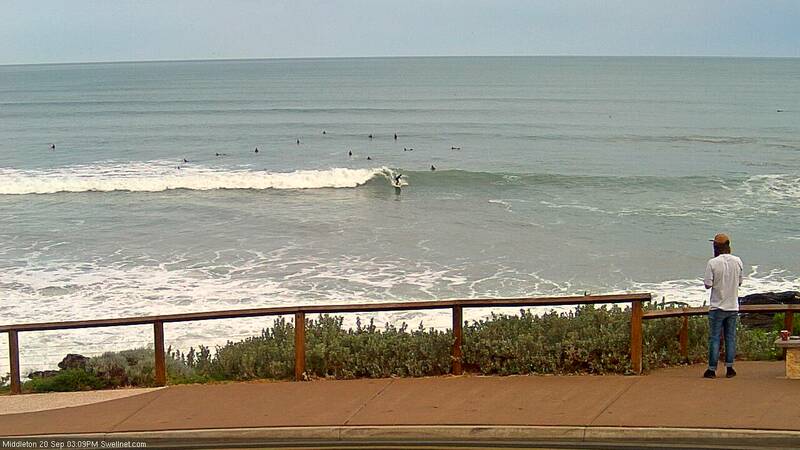 hey ben, i dont surf any more but i put the SA cams on my tv for long stretches most days. really appreciate the work. curious to know more about the setups you are using. can i read about that anywhere? Tech specs? Nah, I don't really want to disclose how we do what we do, as everything is in-house and quite unique. Thanks for the nice words though. fair enough, should definitely look at selling your installs to state governments... have you seen the SA government webcam offerings? pretty depressing really! Any update on the middleton cam? Nothing confirmed, sorry. Been on the road quite a bit over the last couple of months, and have a number of offline surfcams to sort first (hardware failures, NBN upgrades), then I'll get on to this. Sorry.. just don't have the resources to do everything right now. Six months since "We have a second point cam going on shortly." and now "Nothing confirmed, sorry", and sorting out, "NBN upgrades". Kinda sounds like this job slipped out of the to do tray onto the desk and is now on the floor under "that" pile. I like your site and since I paid my subs I don't have to watch all those irritating ads, but at least the ads on the middleton cam give you something to do while you cant see anything! Sorry mate. I wish I had the resources to allocate someone to this job, but I don’t. We’re wading through a large number of technical issues behind the scenes (that the general public don’t see) that take priority over a sixth South Oz surfcam. Keeping in mind that at five SA cams now, we have more surfcams in SA than Vic and WA (and Tas, where we have none at the moment). For what it’s worth, the Point cam is on site at Middleton and the cable is run, all I need is a whole day free to work on site with a fabricator to get the bracket made. And then get our sparky to install it. But, finding a free day has been impossible of late. Any progress on the camera panning at Middleton Point? 11 months since the first correspondence. It's not about getting the camera to pan (the existing camera is a fixed camera), it's about building a custom bracket so we can mount a second fixed camera (that's already on site, ready to be installed). Unfortunately, still no progress - sorry - had a mountain of things to do here, and every time I've tried to work with a fabricator, they haven't understood the job - so it quickly gets pushed into the too-hard basket. But, it hasn't been forgotton - just need to find a few more hours in the day to get through this mountain of unfinished tasks. Now that the Middleton cam isn't working on (nearly) the anniversary of the new one being installed, perhaps the tech can install the long lost bracket when he/she is doing the repair so it will be able it to pan down the coast. ??? Just wondering. Middleton has a power outage today (see below). Not much we can do - we have a UPS on site but they only last 30 mins. In any case the local internet would have been knocked out anyway. Our (additional) Middleton Point cam should go live in a few weeks, around the same time that our new Goolwa cam will also go live. The data connection is in, just gotta find time for our sparky to install it. Goolwa install is booked in for Nov 1st (we sent the gear over a few weeks ago, but we had a problem with the courier who were delayed in picking it up - so it arrived in Adelaide later than expected and we missed our early-October install window before the sparky went on holiday). But, we've been advised the internet line is all up and running so we should be good to activate it that day. Middleton Point should be done the same time, assuming the bracket is finished by then (it's being constructed this week). Good news. 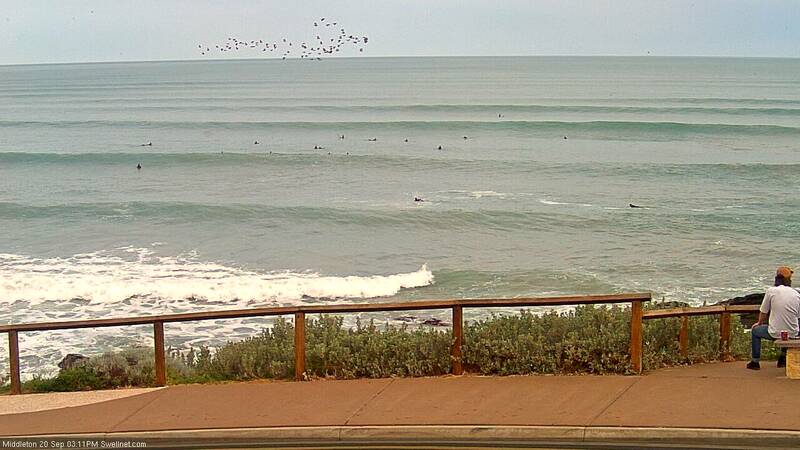 The Goolwa cam will be really interesting - the summer Nor east South east is more offshore and if it pans to the West will provide a really good view of a part of the coast where the summer crowds are usually a little bit lighter. Al Wiese - mate its Day Avenue, never was Day Street, dunno why people use the wrong name. Have a look at the sign next time you are down there. I’d also love to know the origins of Four Point Boardriders, which my old man was a member of. The only points found in that neck of the woods are at the Port Elliot Football Club. I remember a mate was asked to join when we were in high school and we thought he was a hero! Almost there. Still waiting for the bracket to be finished. 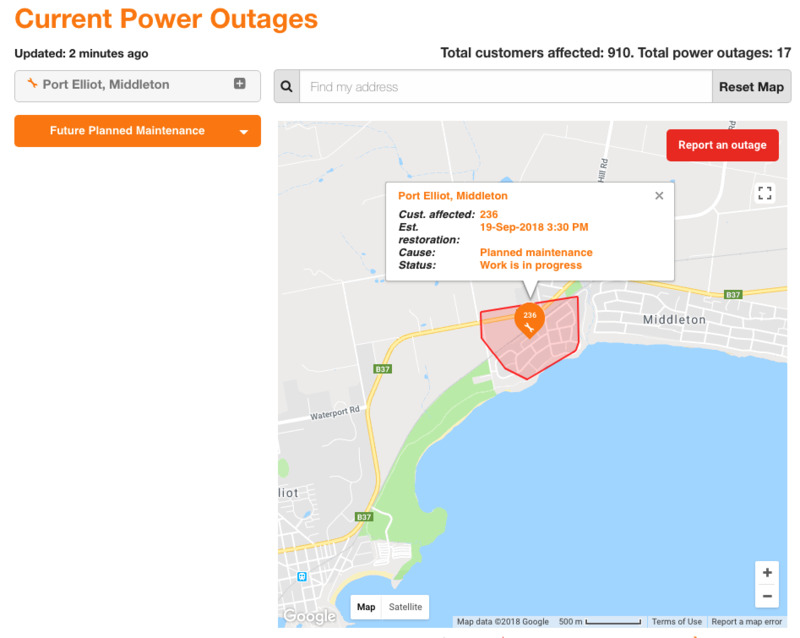 The new surfcam at Goolwa was installed last week but we've got NBN issues at the site that have delayed it going live - technician is booked in for Tuesday so hopefully we'll see it up and running mid-week. Thanks looking forward to Goolwa going live. Today is a perfect example of when it will be super useful. Middleton panning will be fantastic this time of year as well. Surfing the point during summer can be life threatening summertime. Ben, I love the new cam, and definitely worth the subscription. I guess the location is probably Middleton East and if it panned a little bit further to the East, then it would capture Goolwa beach. Same with the West pan, maybe another 15 degrees, then it would show Daystreet, all the way to Middleton point. Once again, love your work and the cams! 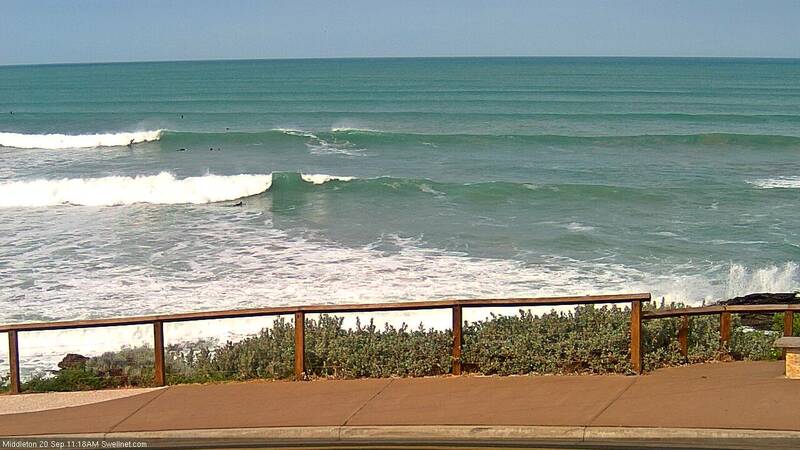 Thanks coastflyer, stoked you like it - it's definitely the best cam to assess surf size at Victor. However it will get dirty very quickly so my next priority is to install one of our brand new remote cleaning systems. As for the location - the camera is physically not quite at Goolwa, though for the ease of perspective and identification (and SEO), we've named it Goolwa because it essentially looks over that stretch. FWIW, a surfcam at the Goolwa car park (or thereabouts) would have a terrible view due to the low elevation - you would't see anything beyond the shorebreak. Also, the camera can actually see right down past Goolwa towards Beacon 19 (and also west to Middleton Point) but it doesn't really add any extra value IMO (and the side-on view isn't great, because of the broad width of the surf zone). Between the Goolwa, Middleton Bay (and the upcoming Middleton Point) and Knights surfcams, you should be able to make a proper assessment of surf conditions down south.